Stock status is current as of 4/26/2019 6:01 AMET. Transform any surface into a personalized sit-stand work area. Get affordable ergonomics! Stay energized, healthy and productive while you compute - change from a sitting to a standing position whenever you want. 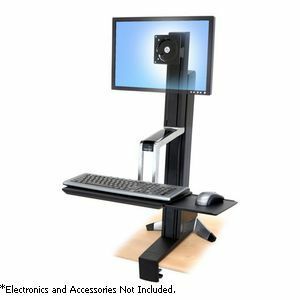 This height-adjustable workstation moves your keyboard and display in one simple motion, making computing comfortable for prolonged periods. Recommended Display Size: Up to 27"